When I created my original list of the books I wanted to read for Christmas, this book ranking high. At first, I couldn't seem to get a copy from the library, even through the interlibrary loan. Thankfully, CBD.com had a sale on Christmas books and I was able to buy a copy. I'm so glad I did because this book certainly added to my Christmas cheer. Zack Kahler is heading back to Texas to run his own newspaper, but not before he has a run-in with two six year-old pickpockets. The two orphans touch his heart and before he knows it, he started the adoption process. This isn't the first time for Zack. At one time in his life, he helped another social outcast, Chloe Weaver, and is surprised when their paths cross again. He soon finds he's got his hands full raising two children and developing a relationship with Chloe. I loved the characters in this novel. Zack, and the twins. They won my heart early on in the novel. I was fascinated by the concept of a single father raising two children. Chloe also provides the novel with a feminine touch that isn't annoying. She doesn't spend the story whining about her problems. Her issues seem realistic and I found myself caring what happened to her. This is truly a magical book add to any Christmas bookshelf. I’m looking forward to reading more of Mill's books. 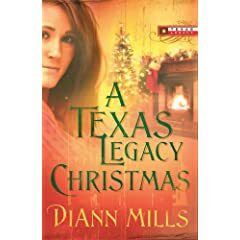 Thank you for you kind words about A Texas Legacy Christmas. I appreciate you!